Okay, if this is too goofy you all are going to have to tell me, but I think I might be on to something. I've been experimenting with my driftwood buttons to see what other items I can 'adorn' with them (since, as you know, I have piles of driftwood throughout the lower level!). So why knot (get it?) create Beach Button Bows to decorate your packages when a beachy theme is appropriate? It's a great environmentally friendly product too -- they're made of muslin and driftwood -- how much greener can you get? Comments? There's been a lot going on in my little workroom. I finally found the right inspiration to create the pillows that could set off these vintage anchor buttons I bought from a vintage shop months ago. 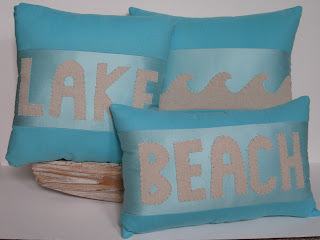 Two utilize Tommy Bahama fabric with a straw canvas. The others are pleated linen with straw canvas accents. As soon as the stuffing arrives I can complete them! 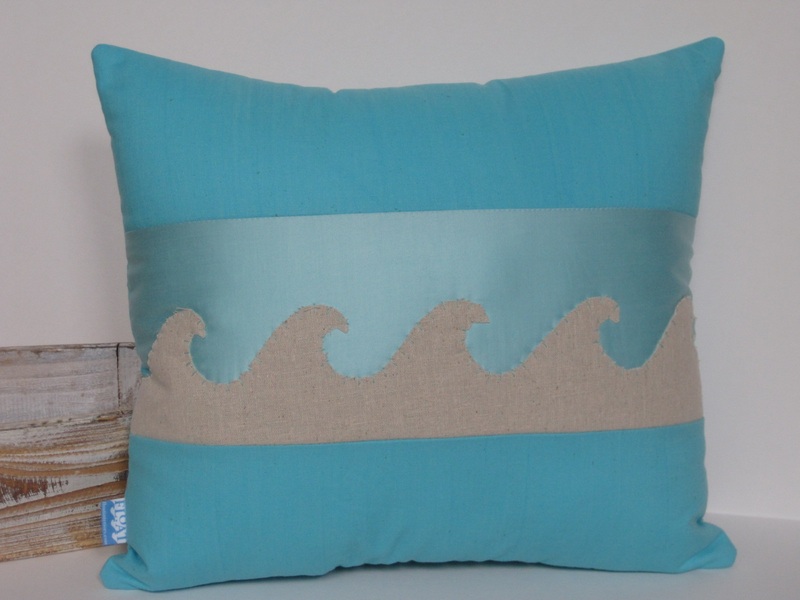 Creamy canvas nautical pillows with nautical knot accent. I don't often make multiples, but these were fun to make. I bought this piece of fabric thinking it would go with some other that I have in stock. But I didn't like them together so decided to make a set of envelope pillows. They are not yet finished as I need my official grommet setter (Ken) to snap them together. I also just received my bag of stuffing today. While Mom was visiting, we got quite crafty on a couple afternoons. 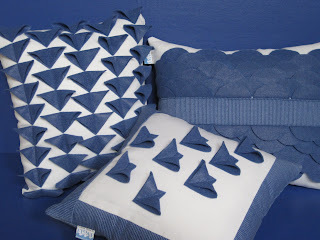 It all started with "I've got this piece of blue felt...."
I had a chance to make a few more pillows in the Aqua applique collection. I started with Beach and have now added Lake and Waves. I wanted to use the waves in my Float logo but was trying to figure out how to draw them in the necessary scale when mom looked over at the Float sign I have in my sewing room and said, heh, we can trace those. And, she was right. They were the perfect size. I also am now using a technique taught to me by Marguerite. I was showing her how my pillow stuffing looked lumpy when I used thinner fabric. She said she puts a piece of batting under the fabric and that helps. It sure does!